Your donations fund research that brings better treatments and cures to children with cancer. 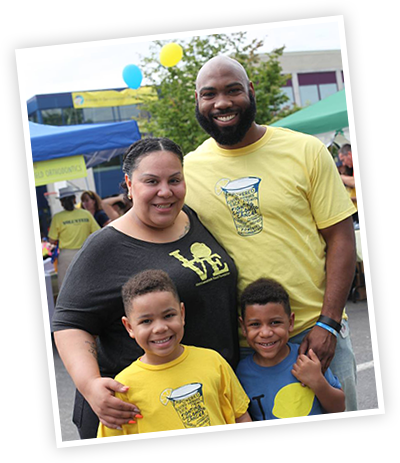 ALSF also provides emotional, financial and logistical support to childhood cancer families that makes their challenges more manageable. Programs like SuperSibs and Travel For Care have an immediate impact on families dealing with a childhood cancer diagnosis. The ALSF Grant Program funds research every step of the way—from early stage innovative research all the way through to lifesaving clinical trials for kids with cancer. ALSF’s new initiatives are having an impact on research worldwide—the ALSF Childhood Cancer Data Lab and the upcoming Crazy 8 Initiative are bringing together the brightest minds from around the globe to fight childhood cancer. ALSF is also the only childhood cancer research organization that has been given the NCI peer-reviewed funder designation for rigorous selection of research grants. When you donate, you are a part of the cutting-edge research breakthroughs that will ultimately help kids beat cancer. ALSF uses big data for a bigger impact. The Childhood Cancer Data Lab (CCDL) is an informatics lab that accelerates the pace of finding cures for childhood cancer. Using artificial intelligence and deep learning, the CCDL is currently harmonizing all publicly available data at refine.bio. The result: The largest set of harmonized transcriptome data that exists. What's even better is that accessing and sharing data is free to researchers. We train scientists to put this incredibly valuable information to the best use possible. Having a child with cancer is one of the most difficult situations a family can face. ALSF is committed to providing support and resources to families that will make their days a little easier and their challenges more manageable. The ALSF Travel For Care program helps to offset travel expenses for families who must travel to receive potentially lifesaving treatment for a child. In addition to this, brothers and sisters of cancer patients often face complex emotions as their family is thrown into the turmoil of managing a child’s treatment. ALSF’s one-of-a-kind SuperSibs program is dedicated to comforting, encouraging, and empowering siblings as their brother or sister fights cancer. At age 11, Taylor was diagnosed with osteosarcoma, a type of bone cancer. After two relapses, a clinical trial made possible by an infrastructure grant from ALSF gave Taylor and her family hope. Everyone talks about finding cures, but no one has a plan. We have the plan—the Crazy 8 Initiative. ALSF has always been about collaboration and working together to find cures. As a leader in funding childhood cancer research and accelerating cures, the organization has facilitated unprecedented collaboration between the brightest minds in childhood cancer research from around the globe. In the spirit of growing that collaboration, ALSF is launching the Crazy 8 Initiative to detail roadmaps for cures for specific, hard-to-treat childhood cancers and pressing topics of the childhood cancer community. We want to know what needs to happen to move the needle for kids with cancer and how much it will cost. How can we find better treatments and cures for childhood cancer? When Eirini Papapetrou, MD, PhD from the Icahn School of Medicine at Mount Sinai started her lab, she devoted her research to developing specialized cell models to use to research rare types of leukemia. Every contribution helps advance ALSF's goals to find a cure and help families.